Welcome to the first Wild Asia Palm Oil Initiative Newsletter for 2017 which provides updates on our work in palm oil. Wild Asia has been working for the last decade to understand the complexities on the ground, working with oil palm producers both big and small in many of the world’s palm oil regions. Over the years, we have built meaningful partnerships with key players in the palm oil industry. These “Palm Partnerships” are core to Wild Asia’s work, where we support them in meeting various commitments such as those to zero deforestation. We want to move away from a mind-set of “compliance” and instead promote dialogue, trust and impactful action. 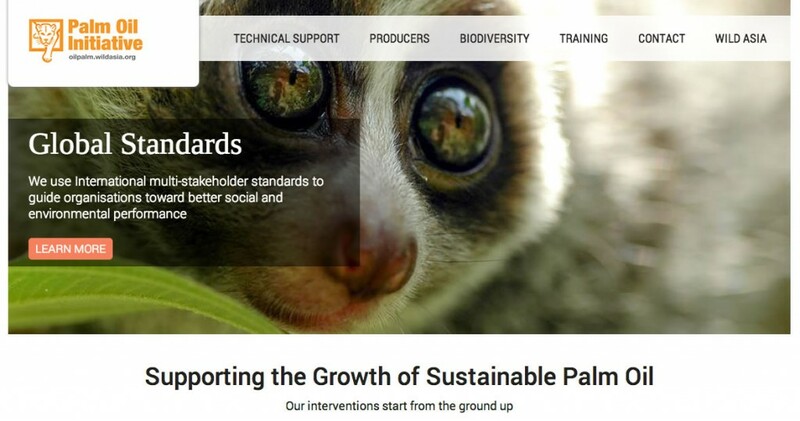 This is the essence of what Wild Asia hopes to achieve with its “Palm Partnerships” this year. To date, our “Palm Partnerships” have been operational in over five local regions across Malaysia, each with an interesting mix of global and national palm oil actors. These partnerships have been able to bring the end users, global brands and local palm producers together. To learn more about projects and partnerships, visit our website. It has been recently announced that compliance to the Malaysian Sustainable Palm Oil (MSPO) certification standard will be made mandatory by the end of 2019. On February 16, 2017, The Ministry of Plantation Industries and Commodities (MPIC) hosted a workshop to gather feedback and discuss a way to take this forward with the palm oil industry in Malaysia. Wild Asia was invited to share our knowledge and experiences in working with small producers and guiding them towards sustainability at the recent meeting of Conservation Directors from WWF offices around the globe on 22 February 2017. At this meeting Wild Asia spoke about the importance of nurturing partnerships with key industry players, innovative means to support field implementation and tailoring approaches to help farmers meet International standards and requirements such as RSPO, Zero Deforestation, Fair Labour etc. The aim was to share our work on-the ground work to help inform WWF’s programme in supporting the industry toward sustainability. Wild Asia, with support from its partner Cargill, has expanded the number of RSPO certified smallholders under the Wild Asia Group Scheme (WAGS) in Perak, Malaysia to 175 smallholders in February 2017. The audit was completed against the latest 2016 RSPO Group Certification Standards. The group collectively produces about 21,000 tonnes of certified Fresh fruit bunches (FFB) and 4,000 tonnes of crude palm oil , which is a three- fold increase from 2015. The increase in production has not only helped create more availability of certified palm oil in Cargill’s supply chain in Malaysia but also gives certified smallholders the benefit of being connected to the global CSPO supply chain. WAGS Perak is focused on sustainable palm oil production through partnerships with independent smallholders, palm oil dealers, mills and refiners. It is a unique project as when it started, it was the first time an independent dealership was engaged to group and support their Independent FFB suppliers to meet the RSPO Group Standard. Wild Asia’s very own Green Warrior! Wild Asia’s technical officer, Izzaty, successfully completed her Green Warrior Permaculture course. An exciting 2-weeks hands-on course at a Permaculture Field School in the south of Palawan, Philippines. The course aimed to provide technical expertise and training on using permaculture to create food security, water security, and sustainable livelihoods. Izzaty learnt skills & techniques on nursery management, Integrated Pest Management, enriching soils, using locally made fertilizer, water sanitation and even constructing a compost toilet! We are excited to bring these concepts to our small producer support programme. We will share our experiences as we trial these methods over the course of 2017. Watch this space for more. New & Improved RSPO Lead Auditors Course! Wild Asia’s Academy has just announced its latest course “RSPO Lead Auditors Plus”. This is an important update to our long-standing training for lead auditors. For the first time we will be giving the course both in an online and classroom environment. The classroom component will be held between 15-19th May 2017. The course is designed for professionals in the palm oil industry.Learn more. The RSPO EU RT, scheduled to take place in June 2017, will be addressing matters on smallholders and connecting them to European markets. The review of RSPO P&C 2017 P&C Certification System Document is scheduled to take place this year. All the best for the new year and we look forward to an exciting one!